On October 9th, 2012, Tropical Foods had its Flavors of the Fall Recipe Contest with the culinary students at the Charlotte Campus of Johnson & Wales University. 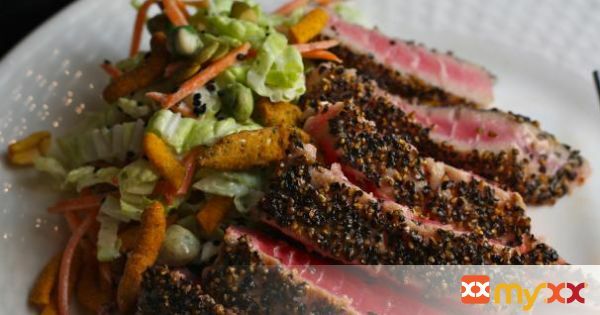 This recipe, Pepper Crusted Ahi Tuna with Sweet and Spicy Asian Slaw, was created by Meagan Peoples. 3. Thinly slice napa cabbage and green cabbage, place into another large mixing bowl. 6. Combine cabbage with dressing and toss in black sesame seeds, wasabi peas and Tropical Food’s Mexicali Fire®. 7. Crust each tuna filet with course ground black pepper. 8. Grill or sauté for 2 minutes on each side until seared, but still raw inside. 9. Slice and plate with Asian slaw.